I received an email last week inquiring about entrepreneurship rates during challenging economic times. The assumption of the email was that entrepreneurship rates are higher during economic busts. People lose their jobs, goes the thinking, so they start businesses out of necessity for generating an income. This necessity-based version of starting a business is referred to as ‘push’ entrepreneurship, as opposed to ‘pull’ entrepreneurship, starting a business in pursuit of an opportunity. Evidence of push entrepreneurship during economic hard-times is lacking, however. Likely contributing to this fact is that during recessionary or economically challenging times, entrepreneurial activity may be constrained by more limited opportunity to borrow money or raise equity capital. Lenders and investors both become more cautious during uncertain economic times. Many or most new businesses need capital, so access to credit can certainly affect the decision to become an entrepreneur. In addition, prospective entrepreneurs may become more risk averse in economic downturns. An important element of entrepreneurship is a willingness to bear risk, and the ‘animal spirits’ of aspiring entrepreneurs may be diminished during economically uncertain periods. My colleagues examined this issue using data from the survey of ISU alumni (Stopping Start-ups: How the Business Cycle Affects Entrepreneurship). The study examined whether business cycles have a measurable temporary or permanent impact on life-cycle entrepreneurial decisions. In particular, the study measured the impact of the economic climate at the time of labor market entry on the probability of opening a business in the first 15 years after entry. The primary focus of the study was on two cohorts of Iowa State University graduates. The first, labeled the ‘bust generation,’ graduated in 1982, up to that time the worst recession since World War II. The second, labeled the ‘boom generation,’ graduated in 1992, the start of the longest uninterrupted period of economic expansion in the history of the United States. If business cycles affect life-cycle entrepreneurship, the contrast between these two cohorts should reveal the impact. 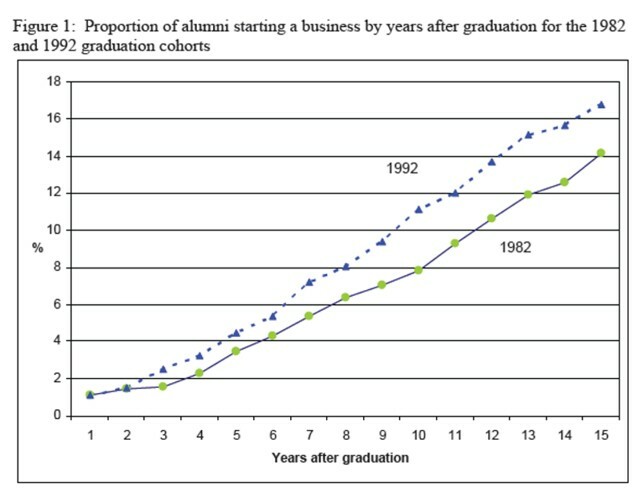 The study found that individuals graduating during the economic bust of the early 1980s were less likely to start a business than are those who graduated in the economic boom of the 1990s. However, the impact was found to only be temporary. While the economic bust slowed entrepreneurial entry by about two years, it did not permanently stop the bust cohort from opening a business. Starting a business and pursing an entrepreneurial opportunity are typically part of a career approach. External events such as recessions can impact starting a business for an entrepreneurial minded individual, but it may only be a delay. Personal events may have the same affect. Marriage, birth of a child, an unexpected financial setback, for example. While the study suggests that recessions will reduce firm start-ups, it also reveals that the impact is temporary and not permanent. If an individual determines that an entrepreneurial career path is desirable, the results suggest that the individual will eventually start a business. Even historically weak economic conditions at labor market entry will only delay the business start-up for a short period. Others who study entrepreneurship are posing questions about longer-term reductions in entrepreneurship, leaving aside transitory issues related to economic conditions. In July the Kauffman Foundation released a study that reported that the United States appears to be suffering from a long-term leak in job creation that pre-dates the recession and has the potential to persist for an unknown time. The heart of the problem explored by the Kauffman study is a pullback by newly created businesses, the economy’s most critical source of job creation, which are generating substantially fewer jobs than one would expect based on past experience. I’ll dive into the issue of long-term entrepreneurship rates in the next post.